Photo challenge: there are moments to capture and share. Ahmed Ela village – Danakil, Ethiopia. Bellissime le tue fotografie della Mongolia, ci sono stato e per questo le apprezzo di più. Wow, a great room! Pefect! Fabulous. Can’t believe how this is constructed! Thanks, Rusha. And you have to consider that that’s a desert region, treeless, so collecting those branches from far away must have taken years. Odd to say, I hadn’t even thought of that. A true testament to someone’s creativity and perseverance. Wow! 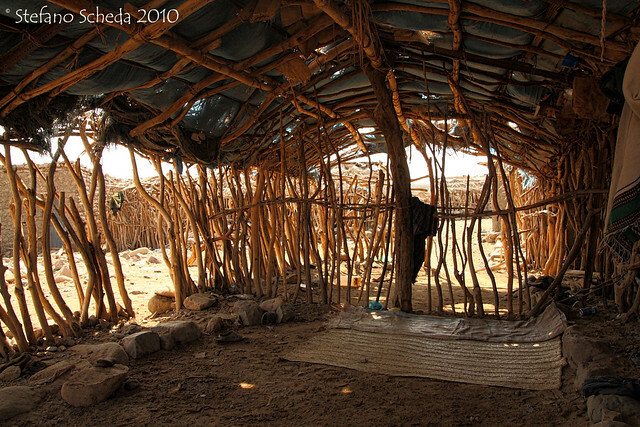 The ingenuity it took to craft this shelter is amazing. Certainly reflects the saying “Necessity is the mother of invention.” Wonderful submission for the challenge, Stefano! A haven in the heat. Beautiful colors, Stefano. Thank you, Marion. Yes, around there is heat and dust. Stefano, you have some of the most unique photos. This is a room that must have taken some time to prepare and would, I imagine, provide welcome shade. Thanks, Janet. Shade and ventilation, both very welcome. Wonderful choice Stefano, as always! Wonderful interpretation Stefano. I so want to visit Ethiopia. fascinating room – I have never seen anything like it – very cool….